This compact combination espresso machine and 10 cup coffee maker could be the coffee machine of your dreams. 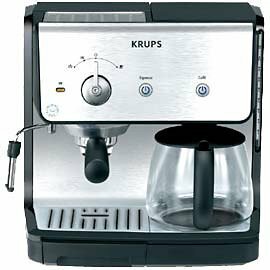 The simple controls allow users to easily switch from brewing espresso to frothing milk--water filtration is optional, and the water reservoir (removable for easy cleaning) holds enough to provide 25 shots of delicious espresso. The coffee brewing function is simple--on and off. User reports can't be ignored. The people who are happy with this machine haven't owned it for long. The construction is delicate--plastic parts are inherently brittle and fracture under ordinary use, resulting in a multitude of problems. Although the quality of the brew is high, the unit often does not outlive the one year warranty. Electrical problems as well as problems with the steamer fittings (which sometimes fail under pressure) have not been well addressed by the company's service department. Replacement parts are scarce, and replacement units are of the same quality as the originals. Considering the types of failures reported, caution is advised. Unplug the unit when it is not in use and treat the XP2010 as though it's made of glass. Don't run the espresso pump if the reservoir is dry--that will ruin almost any pump, not just this one.